You can clarify how things are going regarding your health, relationships, work or other areas. If you wish, you can then act on this information and continue to shape your future. Let’s explore these steps. What is going well in your life at the moment? You may be taking care of your body, enjoying time with your children, developing new skills at work or whatever. One person said the following. My relationship with my wife is blossoming. So I aim to keep spending quality time with her. Two broken marriages have left their toll. I don’t want it to happen again. We plan to stay together for the rest of our lives. I am also doing a stimulating project at work. I want to build on this and show my employers how we can turn it into a profitable service for our customers. Looking at other things, I have returned to singing in a band and writing songs. This is something I did in my youth, but have put aside for a while. I intend to create my own website where I can publish the songs. Peak performers build on what is going well. They apply the same sense of urgency to these issues as to those that are in the red zone. A Formula 1 driver may be leading a Grand Prix by 20 seconds but they apply the same concentration as if they are 20 seconds behind the leader. Superb sales people devote more time to their best customers than to their poor customers. Why? They realise it is the best way to get even more sales. Great workers capitalise on what is working. They do not wait for a crisis before springing into action. Similar rules apply across all aspects of life. If you wish, try tacking the exercise on this theme. This invites you to do the following things. Describe the specific things that are going well in your life and are in the green zone. Describe the specific things you can do to build on these things. 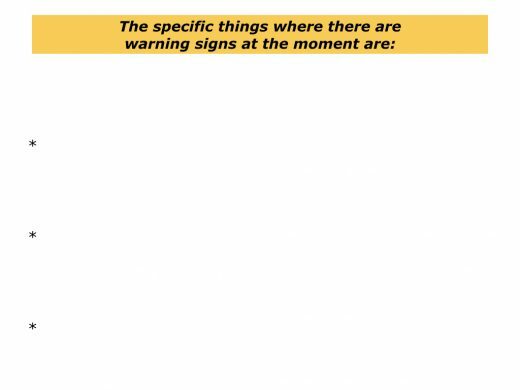 What are the activities where there are warning signs? You may detect these signals in your health, some relationships, financial matters or aspects of your work. How happy are you at the moment? Are there things in the amber zone that it may be important to tackle? One person said the following. My health may be becoming issue. During the past year I have put on 2 kilos. Doesn’t sound much, but in the old days I was able to lose weight easily. So it’s time to start moving. Even though it is January, I am going to start running, rather than wait for the spring. There are also some warning signs at work. The team I lead is successful, but a couple of the team members have started to behave in negative ways that affect other people. I will clarify whether they want to follow the agreed professional principles. If not, that is okay. I will replace them with people who want to behave in a professional way and contribute towards achieving the goals. How are things for you in work? Do you spend the majority of your time doing work that is satisfying? If not, what is the effect on your energy? What can you do to improve matters? Imagine you are a leader. Looking at your team, who are the people who are positive? Are there any people who take energy? If so, what are the consequences, both for you and for other team members? How can you fix these issues before they go into the red zone? 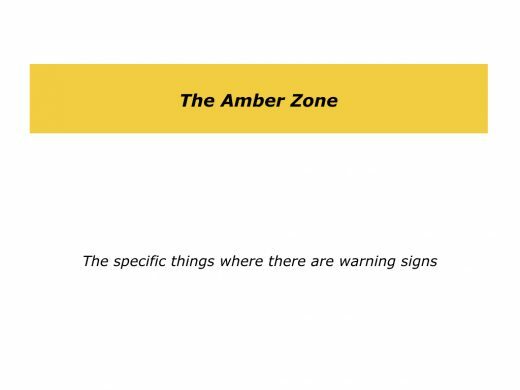 Describe the specific things where there are warning signs and may be in the amber zone. Describe the specific things you can do to tackle and improve these things. Looking at your life, are there any things that are not going well? Are there any issues that are causing difficulties? Are there any recurring problems that create collateral damage for yourself or other people? Sometimes it is possible to find solutions. Sometimes it is important to identify the issues and then make a decision about the possible routes forwards. One person said the following. One day I realised that I simply had to take more control of my life and work. I had allowed myself to become overwhelmed at work and this affected my health. I always felt tired and I had high blood pressure. I tried to turn things around by working more hours, but this did not help. Matters came to a head when I tried to cram in a customer appointment on the way home, got caught in a traffic jam and missed my daughter’s Christmas Play. This rude awakening taught me to take more control of my life. It also set me on the route to trying to repair my marriage. 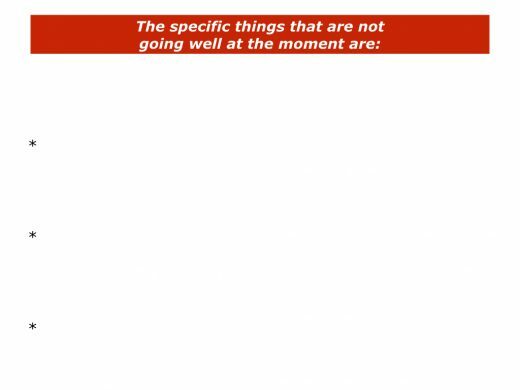 Describe the specific things that may not be going well and are in the red zone. 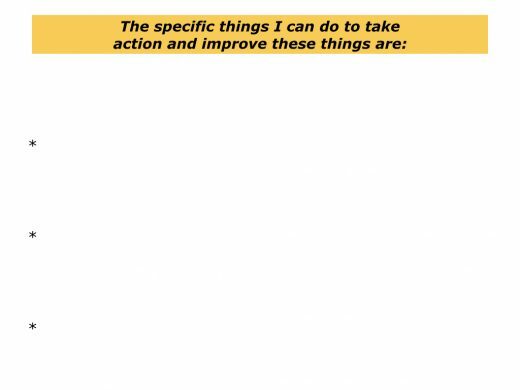 Describe the specific things you can do to take action and improve these things. 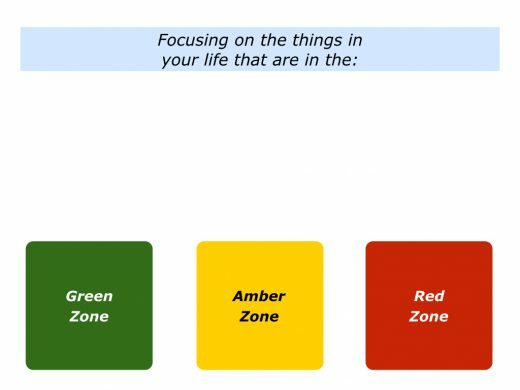 So far we have looked at the things in your life that are in the green, amber and red zones. If you wish, you can add another dimension. To build on your strengths … To do more of the specific activities that give you positive energy … To do satisfying work … To do stimulating projects … To improve your skills … To keep developing as a person and as a professional … To pass on your knowledge to people … Or whatever. Describe the specific things you may want to do to keep developing. Describe the specific steps you can take to do some of these things. Imagine that you have described what is happening in the various zones. 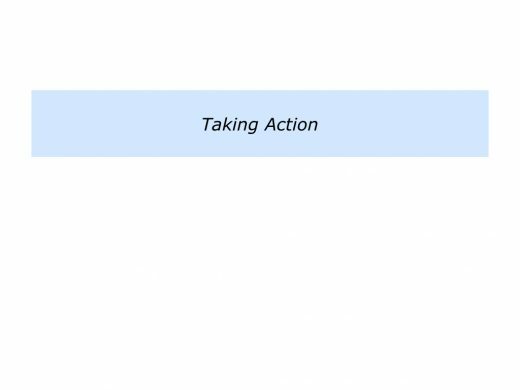 It is now time to translate your findings into action. You may want to keep building on what is going well and tackle the issues where there are warning signs. You may also want to explore some of the ideas you have for continuing to develop. If you wish, tackling the final exercise on this theme. This invites you to review what you have written when describing things that are in the green, amber, red and blue zones. It then invites you to do the following things. 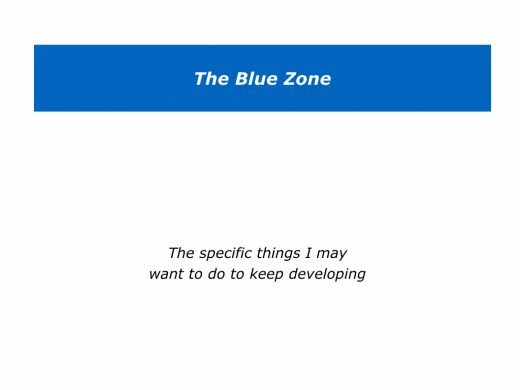 Describe the specific actions you want to take regarding the things that are in the different zones. 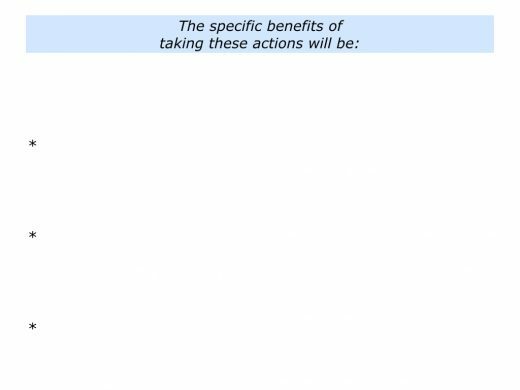 Describe the specific benefits of taking these actions – both for you and for other people.